What if I told you that you’re pinning too much and it’s causing you problems? You’d probably laugh at me, wouldn’t you? But, just hear me out for a bit. If you have a Pinterest account that is solely for your own personal use, that is awesome. You’re not pinning too much, because it’s for hobby. Pinterest is a lot of fun. I love it myself. More than any other social media, I’m TOTALLY a Pinterest girl. But, if you are a blogger who wants to make an income from your blog, you are pinning TOO MUCH!! In life, we think the more we do something the better. If I make MORE money, it’s better, right? If I have more than one car, it’s better, right? More is better. But in Pinterest’s case, the OPPOSITE is true. Facebook is a social media platform that thrives on showing viewers the best content. Google is the same way. When you search something, Google wants to put in front of your face, the absolute best, more relevant results period. The better your site is, the more popular it is, the more traffic Google sends your way. Such is the same with Pinterest. If you have a lot of repins that are 1’s and 0’s, Pinterest starts to think you’re not popular because what you’re pinning isn’t resonating with its viewers. It’s like shooting in the dark. You pin something and HOPE it gets a lot of repins. You HOPE it gets traffic. You HOPE to get more visibility, but if you are pinning and getting less than 5 repins, whether in a group board or your own boards, it is my belief that Pinterest is somehow penalizing you for that in the way that we are telling them we are not popular. I recently tested this theory and my Pinterest account tanked! I went from 7 million in reach to 3 million in reach, and now, I’m going back to pinning just the best of the best, and hopefully, I can get my reach back up by pinning less. It’s the story of the rich and poor. Does it ever seem like the rich just keep getting richer and the poor just stay where they are at? Like it’s really almost impossible to cross from one status to another? Maybe you feel that way on your blog. You just can’t seem to become a top blogger no matter how hard you try? The truth is that the most popular blogs DO keep getting richer. Google sends them more traffic because again, Google wants to put the best, most popular content in front of their viewers. Facebook sends them more traffic because Facebook wants to put the best, most popular content in front of viewers. I have no clue about Twitter. I’m not Twitterfied. Hate that platform because they limit my characters and I’m a talker. LOL. Pinterest is the same. They send popular blogs more traffic because they want to put the best, most popular content in front of the viewers. So, in order to get “SEO internet juice,” if you will, you pin, share, and post the most popular stuff. It’s like a free piggy back ride. While it’s true, you DO want to share the best content because it means more traffic, you don’t want to do it SOLELY for that purpose. Reason #1 is because you start going down a road of becoming self-absorbed. You can begin to take the free piggy back ride for granted and when social media makes you get off the ride, you get ticked. You’re left in the middle of the street, no where to go, no more good juice, no traffic, it’s over. You struggle to find the next back to ride. You can’t think of yourself like that. You’re a blogger, not a copier. You want to DO something unique, BE unique. Everything is always the same online. It’s all the same stuff. You have to find the balance. Sharing stuff YOU truly love and sharing what is popular. You should NEVER share something you don’t love just because it’s popular. Plain and simple, yes, it’s the rich and the poor, yes it’s top blogger and blogger who wants to find a break, but it’s part of the game. This is how I think of it. If I’m sharing 20 popular pins (that I love), then I’m getting fantastic traffic and I’m doing a lot less work than shooting in the dark pinning 200 pins a day of junk. I’d encourage you to NOT pin to a board or a group board where pins get less than 5 repins. It’s NOT worth your time. It’s far better to pin to 5 of the best boards and get 1,000 repins, than to pin to 20 boards and get 500 repins, and I can tell you, from all my testing, that is EXACTLY what’s happening. Even with your OWN pins. If you look at what I’m pinning, I’m not pinning to every board I’m on. In fact, I deleted a lot of group boards I was on and a lot of pins. If you want to see that article in depth, it’s here. I pin to only the best boards, and honestly, I pin too much too. It’s a long-term plan to get your pin amount down. What you DON’T want to do is stop pinning a ton of stuff ALL THE SUDDEN. You’ll lose traffic like crazy and get mad at me. 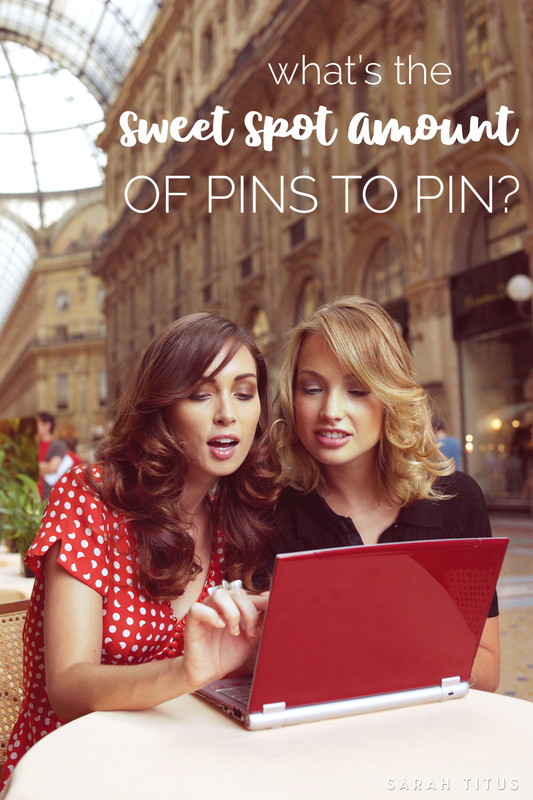 What you DO want to do is to start implementing a plan to pin less, but pin better content. Pin things you actually visit the sites to. Make sure the sites are not scams or spammy. You can install WOT as an extension on your Chrome browser (it might be on other browsers too) and on Pinterest, you will see the circles, so you know right away, who’s bad and who’s not. Go into your analytics on Pinterest and start doing 1 month tests where you pin in each category. Let’s say your top board is home decor. Start pinning 5 pins a day in home decor and cut out 5 pins of other stuff. Next, try another category. After about a week, you will SEE if it’s clicking or not. If it does, you’ll start getting more traffic and more repins. This tells Pinterest you are worth paying attention to and it’s like a snowball. Little by little, you’ll get more and more and more traffic. That is, until they change things up again, which is constant in the blogging world. Boo! If you’re pinning 200 pins a day, for the love of pete, STOP. It’s way too much work when you can pin less if you’re smarter about how you go about pinning. If you’re pinning 100 pins a day, that’s okay, but I would encourage you to try to get down to 30-50. Around 50 is when you don’t see much loss in traffic, but you are still able to not have to work so much. Update: Pinterest JUST changed things this week and now I’m only pinning 10-20 pins a day. They are all of my own pins, not others pins. I used to pin others, but with that brand new update, there’s no way of seeing how effective those pins are, stats-wise. If a pin tanks, it drags down my whole account and I can’t afford to do that. I know my stuff. I know my pins, what does well, what doesn’t. So, we’re kind of forced to pin our own stuff right now because of that brand new change. If you are reading that and thinking, “When am I going to have time to pin 50 pins a day?” – don’t worry. I have you covered. I use Tailwind. It lets me batch my pinning and get it done all at once for several days, weeks or months at a time. Check it out and see if it’s right for you on your pinning process. Pin the popular stuff. There’s really no going around this. One way to do this is to go to your favorite sites and look up their about page, new start here pages, or on their sidebars. Often times, bloggers put their most popular stuff there, so you can tell right away what is most popular and pin that. Stop pinning to boards that consistently get you less than 5 repins. Seriously, it’s not worth it. It’s hurting you more than you realize! Case in point…my Pinterest account tanked in this test! When you pin, pin from your website to the most popular group board FIRST. I don’t know why, but in my testing, this always yields the best results. Perhaps Pinterest sees that pin is doing well and starts showing more people? No clue, but it works. Never, ever, ever, ever pin a horizontal pin. All pins should be square and VERTICALS ARE BEST. On my group board, pinners are deleted for pinning horizontal pins more than 3 times. It’s in my rules and it’s really the only rule I’m a stickler for. I just hate horizontal pins. They never get as much traffic as vertical pins. Double blind test your pins. Sometimes, I will take a pin and double blind test it. I want to see which pin people will like better. So, I’ll pin one pin on one popular board and the other pin on another popular board. Come back several hours later and the pin with the most engagement wins. Then, I’ll continue pinning the better picture on Tailwind and put the better picture in my post as well. I hope you all found this extremely helpful. I really love Pinterest. I study it a lot because I want to be successful on that platform and I encourage you to study it out as well and see what works for you. You can read articles all you want on Pinterest, buy courses, etc., but there’s nothing that can replace you getting in there, getting your hands dirty and getting to work. No one can build a blog for you and everyone’s advice is always so different. So many people claim to be experts and there’s so much BAD advice going around. You fall prey to it when you believe everything you read. Go to Pinterest and start testing things yourself. See what works and what doesn’t. Have your friends help you. Run tests. Run analytics. This is my favorite part of blogging. I LOVE finding the holes of something that is not working, finding out why and fixing it so it becomes successful. That’s what I’ve done with Pinterest for my blog and I encourage you to go out and find those holes for yourself as well so that you can be more successful as well. I’m new to Pinterest and I really appreciate your tips. Thank you for always sharing so much information and trying to help others succeed. Hello, awesome blog post, as always. I used to own a Pinterest account which was suspended because they thought I was “spaming” them and now I’m wondering how many pins should I pin and repin in a day? You sound just like me, determined to find answers! I’ve noticed without doubt, that pins shared from Tailwind get shown to fewer people than hand pinned pins. It’s there in the stats, clear as day. Yet Pinterest themselves say there’s no difference! Not true. If I got 5 repins on every pin I’d be doing a happy dance. If I can get 1 or 2 it’s going well. I so hate Pinterest, it ties you in knots, but I’m determined to figure it out and get my traffic back, I used to get loads. And you’re absolutely right, pinning loads of dross is a killer. Tested it, seen it. Also Tailwind looping was the kiss of death on my reach this week. So I’ve switched that off too. You’re right, everyone has something different to say about Pinterest but your post above is closest to the truth I’ve observed.